We owe a great big THANK YOU to all of our Partners & Donors who help us to support our mission. Kylene worked as part of the Camp Esquagama Team in the late 90’s. Her passion for youth led her to a career as a child life specialist working with varying children hospitals around the country. Her son is a current camper and continues on her legacy at Camp Esquagama. We are deeply grateful for the dedicated youth work Kylene served in her career. 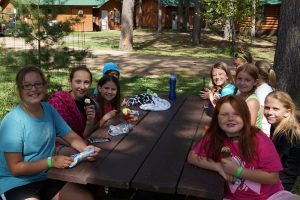 The Kylene Antilla Memorial Fund shares her passion in supporting campers and families take part in a summer camp experience. 100% of our revenue from our Camp Store goes towards supporting the opportunity for a camper attend camp through our Camper Scholarship Fund. This includes our Canteen sales during the camp week and sales during the retreat/rental season. On the last day of each camp session, families can choose to donate the remainder of their Canteen Account to the Canteen 4 Camp Fund as well. If you or your camper ever purchased a candy bar to a teddy bear, we thank you for your support.